Presentation can also be in Tamil, if desired. Be it JIT or SIX SIGMA, a completely satisfying product to a customer is not only about a quality product but about a quality experience. This cannot be achieved sans co-operation between different departments. Cross functional teams try to sort out difference in opinions between departments, and merge their objectives to resolve problems that transcend the departments. This event bridges the gap among various departments and makes them all work together for a common goal! Kaizen means literally "change to become good". The kaizen method of continuous improvement is originally a Japanese management concept for incremental change. It is trouble-free to keep going with old ideas, but improvement helps to reach the next level of success. line. The main objective of poke yoke is to achieve zero defects and reduce defects from mistakes using the simplest and lowest-cost techniques possible.It is the platform to improve quality and increase customer satisfaction.It is one of the components of Zero Quality Control (ZQC) system, the goal of which is to eliminate defective products. over defect detection. It drives customer satisfaction and bottom-line results by reducing variation and waste, thereby promoting a competitive advantage. In simple terms, Six Sigma quality performance means no more than 3.4 defects per million opportunities. mere blueprints. It is obvious that even small creative ideas of individuals may prove to be the foundation stone of tomorrow’s massive technologies. Here is a great opportunity to showcase your innovative ideas. everywhere. 'Capability Maturity Model’, developed by the ‘Software Engineering Institute’, models the 5 levels of organizational ‘maturity’ that determine effectiveness in delivering quality software. The teams are expected to define the focus area of the project and provide an efficient improvement in the process considered based on CMMi principles. o Will not be allowed to continue further. Presentation should be in English. The last date for submission of the Abstract (as a .doc or .pdf file) –31.01.2013. given to the organizers at least an hour before the time of the event. Last minute changes such asin team members, abstract, etc., will not be entertained. 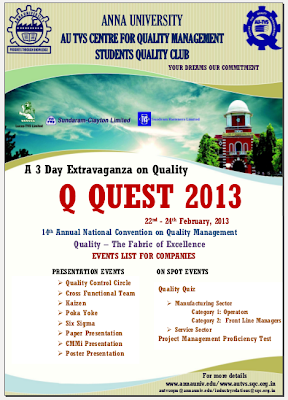 If the number of participating teams exceeds 15, a prelim will be held before Q Quest. Ideas are the pillars on which great societies, great nations and a great world are built. A poster is simply a static visual medium that lets you to communicate ideas and messages. If you have any such impressive and attractive idea and also if you could find some interesting ways to tell them out to the society, the stage is yours! It is an Individual Event as it is purely based on creativity and originality. The poster displayed should be focused on the theme. The event format will be a written prelims followed by Finals. Top 6 teams will move to the Finals from the Prelims. 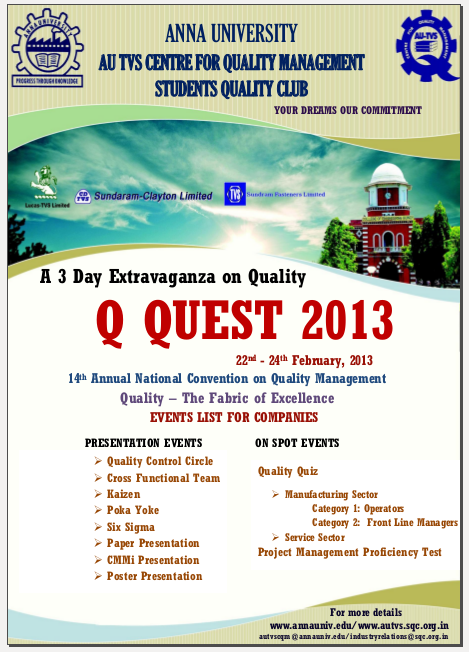 Wilde Q Quest presents the QualityQuiz, an exclusive event for quality zealots and quizzards from the corporate sector. Brace yourself for one of the most challenging quizzes you have ever faced. Bordering on the edges of arbitfundaes, this quiz is sure to have you boiling at the quiz master! This Quiz is conducted exclusively for manufacturing and service sectors. called initiation, planning, executing, controlling and closing. This test is a platform to prove their efficiency for the best project managers. along with the live case studies of different companies under one roof. This sharing and learning concept will be very effective while attempting to make improvements in the respective work places. these delegates will be arranged.